Frankfurt centre-back Salcedo has emerged as one of the finest defensive talents in the Bundesliga, and despite his recent injury woes the Mexican has become a leader for both club and country. As well as helping the Eagles beat Bayern Munich in the 2018 DFB Cup final – not long after returning from a collarbone fracture – he played every minute for El Tri as they reached the last 16 at the 2018 World Cup in Russia. Despite spending his formative years with Mexican sides Chivas and Tigres, it was in the USA, as an MLS homegrown player with Real Salt Lake, that the 25-year-old made some of the biggest leaps in his development. "I felt really good there and well-suited to the MLS," Salcedo explained. "I learnt things that I didn't know from my time in Mexico, because football in the States is similar to football in Europe. It's a bit more physical, more dynamic, and you play against more complete forwards. It certainly helped my defensive training." 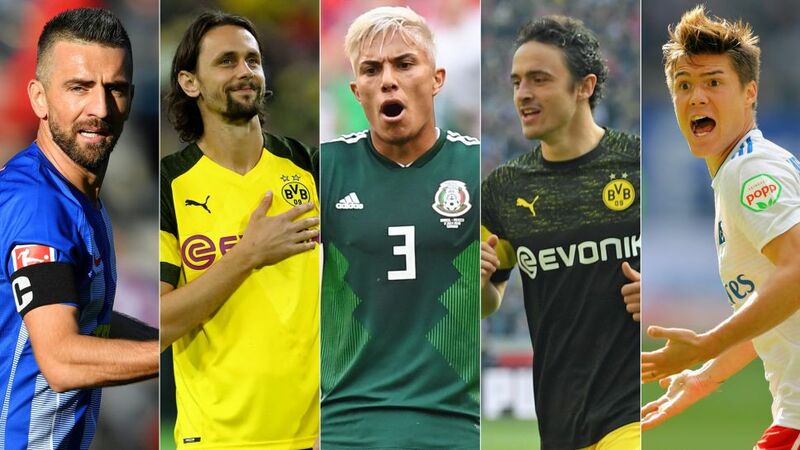 Unlike some of the other Bundesliga talents on this list, Guadalajara-born Salcedo was never in the frame for the US national team, having made his Mexico U21 debut in 2014. However, he still has plenty of star-spangled connections: his godfather Martin Vazquez, the man who brought him to Real Salt Lake, is a former USMNT assistant, while his agent Lyle Yorks, who helped secure a permanent move to Frankfurt, hails from the other side of the pond. Frustrated with a lack of playing time in the MLS, the ambitious Salcedo – whose assurances that he would represent Mexico at the 2018 World Cup fell on deaf ears – left Salt Lake City in early 2015, returning to Chivas before being loaned to Fiorentina in August 2016. It was then on to Frankfurt the following summer, and the rest is history – but there is no denying that 'El Titan' wouldn't be the colossus he is today without his American education. Thomas Joseph Delaney does not sound like a Danish name, and sure enough there is something of a back story as to how a player with an Irish surname ended up representing Denmark at the 2018 World Cup. A paternal great grandfather of Delaney’s moved from Ireland to America many years ago, settling near New York. A branch of the family decided to move to Scandinavia, however, and Thomas’ father was born in Denmark. He grew up in the United States but later returned to Denmark and married a Dane. The Dortmund midfielder was brought up in Frederiksberg in the city of Copenhagen, so it was only natural that he would represent Denmark at international level. When he was still an under-21 international in 2012, Delaney told the Yanks Abroad website that people from the United States Soccer Federation had been in touch to sound out his eligibility. The 27-year-old always wanted to play for the country of his birth, however, and there was little danger that Denmark would let such a talented player slip through the cracks. Ibisevic attended Roosevelt High School and over four years in the US he played college soccer with St. Louis University as well as for two development teams – the St. Louis Strikers and Chicago Fire Premier. Was he one that got away for the United States national team? Not long after leaving the US Ibisevic was approached, but that was shortly after he had decided his international future lay with Bosnia-Herzegovina. Sakai is one of the most experienced Japanese players to have plied his trade in the Bundesliga, making 170 top-flight appearances for VfB Stuttgart and Hamburg. When HSV were finally relegated for the first time in 2017/18, there was no question of club captain Sakai jumping ship – on the contrary, the influential right-back extended his contract and has played every game in Bundesliga 2 as Hamburg bid to return to the elite at the first time of asking. The cosmopolitan Sakai has a Japanese father and a German mother, but he was actually born in New York City in 1991, which would have made him eligible to represent the USA at senior level. Unfortunately for the USMNT, the young Sakai was whipped back to his father's homeland while he was still a young boy and came through the Japanese footballing system, embarking on his senior career with J-League side Albirex Niigata in 2009. While still only 27, Sakai has spent most of his playing days in Germany, having joined Stuttgart at the start of 2012. He could also have played for Die Mannschaft through his mother, but began representing Japan later that year, coming off the bench in a friendly against the United Arab Emirates. Though US Bundesliga stars such as Pulisic were watching from their living rooms as the World Cup got underway in Russia this summer, American-born Sakai was in Saransk as Japan stunned Colombia in their opening Group H encounter. The Samurai Blue would go on to reach the last 16, where they were agonisingly close to an upset against eventual third-place finishers Belgium. Sakai has played for Japan since youth level, but if things had gone differently he could well have ended up representing the Stars and Stripes. While not exactly one that got away, he is an example of the rich vein of American-tinged talent flowing through the German game. Now with Saint-Etienne in France, Subotic is a Dortmund legend who formed a brilliant central defensive partnership with Mats Hummels during the glory years of Jürgen Klopp’s time in charge. The 29-year-old finally left Dortmund for good in January 2018, and took with him a bulky medal haul as a result of winning the Bundesliga in 2011 and 2012, the DFB Cup in 2012, and reaching the UEFA Champions League final in 2013. Subotic was born in the old Yugoslavia but after war broke out there, his family moved from Germany to Salt Lake City, Utah, in 1999. A spell in Florida followed, and the gifted teen would go on to represent the United States at the U17 World Cup in 2005. He then began his professional career in Germany with Mainz, where he first worked with Klopp. Subotic also played for the US U20s and could have played for Bosnia-Herzegovina, but eventually he decided to represent Serbia at senior level, for whom he scored twice in 36 appearances between 2009 and 2013. “I know for some it is difficult to understand why I didn’t continue [with the US],’ Subotic, who featured at the 2010 World Cup, told the Daily Mail in November 2013. “In the end what really decided it was that my parents are Serbian and all my family – my cousins, my uncle, my aunt, my grandma – are all Serbs.